I love making to-do lists. There's nothing quite so satisfying as crossing off each assignment as I complete it. Of course, because I want to feel on top of my homework and studying, I always include items on my to-do list that I've already accomplished. This morning I woke up, showered, went to breakfast at The Paramount with Eileen, came back and made my to-do list for the day. The first five items? 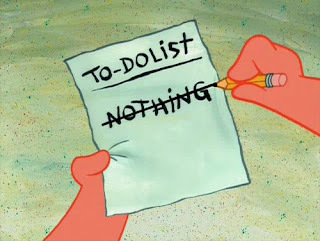 By the looks of my list, I've already had quite the productive day. My friend Zach even showed me a new website TeuxDeux (pronounced to do) that allows you to make a task list online. Is it really necessary? Not for me, but I made an account anyways and planned a to-do list for every day of the week. Perhaps it's counterproductive to make a glorified "I already did it" list (eh, and to blog when I should be studying) but I have to keep my sanity somehow and feeling at least a little organized helps me do that. Plus, I'm tired of reading about if monkeys and fish have a moral code. I think we can all agree that no matter how ethical monkeys act toward one another, they will still fling their poo at you if you upset them. And we eat fish, so I don't think anyone really cares about their emotions. I mean, not that they are exactly fish, but in my family we name and play with lobsters before dropping them into the pot of boiling water on the stove. Fun, yes. Humane, not so much. But, in an act of procrastination, I digress. It's time I get back to prepping for philosophy and revising my to-do list to include blogging. I like living in a world where productivity and procrastination can be one in the same.